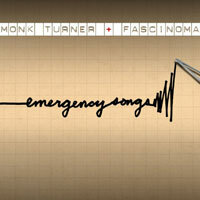 EMERGENCY SONGS is a beautifully arranged, new concept album from Monk Turner and singer/songwriter Fascinoma (Alanna Lin) from Los Angeles, California. Together they bring us 12 wonderful songs filled with a variety of musical flavors and lovely vocals that, even if the music itself gets a little rough, maintains its composure; a very character attribute that could turn to be a critical factor in surviving a major disaster (the theme of the album). The album itself is conceived to awake the imagination of its listeners through both song and story as a massive earthquake is heading straight for LA! And so the lyrics take us on a 35 minute journey through all the phases of the crisis, “from pre-quake boredom, to post-quake freeway BBQ”. LA is due for a massive earthquake but no one is ready. Also, the city, ergo, the state is broke, so if The Big One hits—the earthquake, scientists are predicting, will strike in the uncomfortable window of between now and 30 years—the citizenry will suffer. Everyone knows it is an imminent possibility, but daily life is difficult to live while anticipating total destruction. So the music steps in. EMERGENCY SONGS: Before, During, and After, starts with an acapella public safety address (a part of a BEFORE the quake set) directed to the fellow Los Angeleans and is accompanied by The Emergency Choir, which will be frequently revisiting us throughout the album. Following the next four tracks we are than introduced to the second set of songs aimed at telling a story of what happens DURING a quake with tracks such as HOLD ON!, Lover Won’t You Hold Me, and Prisoner. However it is the very last section (the AFTER) that holds two of my very favorites; songs that slowly make the transition from the melancholy of the past to the possibilities of the future. The easy listening bits are filled with very simple yet powerful lyrics O say can you see the future the way I do, and Say goodbye to our old life, its a brand new world, a new beginning. With a touch of folk heard in tracks such as Where is My Horse?, to jazz influence in Trust, and a more dramatic rock sounds of HOLD ON! ; every track brings with it something new and it is exactly this variety that first drew me to the recording and hope that it will get your attention as well. To find out more about the artists and their music please see the links. Allana LinEMERGENCY SONGSFascinomaHOLD ON!Lover Won't You Hold Memonk turnerPrisonerThe Emergency ChoirTrustWhere is My Horse?